Ah, the Wii. 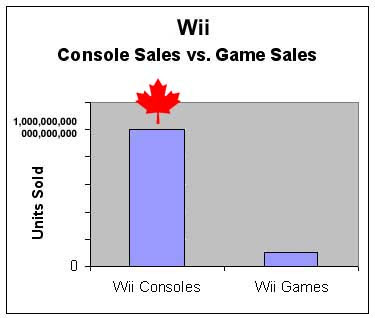 While developers are busy debating whether the console is merely a fad, or a true next gen system, Canadians are still snapping up the great white machine in record numbers. But hey, at least we're all snug and cozy with Capcom. Resident Evil 4 and Resident Evil: Umbrella Chronicles both million sellers? Yes, I think so.